Adding your initial to a project not only feels personal, it feels expensive. Create these unique eyeglass cases featuring non-woven materials, such as Cork or Vinyl and your favorite quilt cotton. Choose your monogram and make it your own. 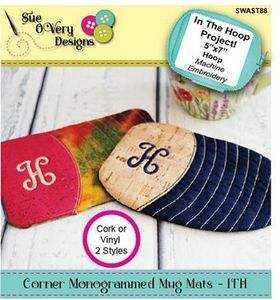 This set comes with two (2) styles, squared edge oval and rectangle. Both the perfect size for a cup of tea or coffee and tiny snack and both super sophisticated and easy. They both require a small amount of Cork or Vinyl 3-1/2in w x 5-1/2in scrap for the left corner and both feature echo-quilting stitches. Created in one hooping (5in x7in or larger) and are constructed like a pillow, with a bit of thin batting or foam inside. Whip up super fast and make the perfect last minute gift on the go. Final dimensions each are 6-1/2in w x 4-3/4in tall Perfect Cork scrap buster.